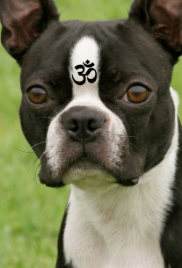 A free-spirited young Buddhist Arhat misbehaves so badly that he qualifies for a little-known amendment to the Law of Karma, the ‘Law of Dogma’, and has to do life as a dog. Sukankar, aka ‘Suk’, is a free-spirited, fun-loving, practical-joking disciple of the Buddha who gets himself into some serious hot water with his pranks and childish games. But a two day disciplinary assignment at the Dharma Wheel turns into a year and he becomes the first disciple to have ever attained Samadhi through devotion to the wheel. In a special ceremony, he is honored for his achievement and is recognized by the Buddha as an Arhat. With his new prestige and notoriety, his ego gets the better of him and he quickly reverts back to his old ways and misbehaves to such a degree that he qualifies himself for a little-known amendment to the “Law of Karma” – “The Law of Dogma”. He must now do an incarnation as a dog. But this is no ordinary canine. He speaks (in English) as he cleverly narrates directly to the audience, and is endowed with ‘prayer fulfillment’, a transcendental power, normally reserved for Buddhas and Bodhisattvas, which allows him to manifest just about anything he wants. As a dog, he initially reverts back to his old ways, using his wits and his special ability for his own amusement, and bounces from one family to another, with visits to animal shelters in between. His adventures land him in a string of comical situations where he encounters a bevy of wacky, amusing characters straight out of central casting. Eventually, he is adopted by a humble family from Central L.A. and is exposed to some of the harsh realities of urban family life. He develops a strong sense of compassion and the realization that his true mission as a dog is to help people solve their problems and alleviate their suffering and he becomes a little, fifteen pound super-hero. We wrap up the story, in the near future, with Sukankar, now human again, being recognized by the modern Buddha as a Bodhisattva who has achieved his spiritual attainment through a life-long commitment to compassionate service to humanity. A Vegas waitress tripled in size falls for the scientist who accidentally enlarged her, sacrificing newfound showroom stardom to save him when he's kidnapped by her abusive ex, a blackmailing mobster and a haughty former showgirl.